Support UNITY Today on GiveNOLA Day! At age 23, KyShanaeh Johnson has been homeless or on the edge of homelessness her entire life. But thanks to support from community donors like you, UNITY of Greater New Orleans – the organization leading efforts to reduce homelessness in New Orleans — found her and her two girls an affordable apartment — with the ongoing help they need to thrive. Tuesday, May 5 is GiveNOLA Day — will you make a donation here to UNITY of Greater New Orleans and help our community meet the goal of finding an apartment for every homeless family in New Orleans by Thanksgiving? Permanently housing every homeless family by Thanksgiving is a big goal, but it is entirely achievable with your help. And it is essential. By strengthening our most vulnerable families, we strengthen New Orleans. KyShanaeh’s situation was one of the most heart-breaking we have encountered. You see, her mother had a disability that led to homelessness, so even when she was a child KyShanaeh was bouncing from place to place. As a child she often did not have enough to eat. And as a young adult, KyShanaeh has landed in a homeless shelter several times. 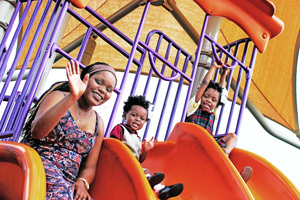 With no family to take her in, KyShanaeh and her two children were pitched into homelessness yet again when she recently lost her steady job as a front-desk clerk at a hotel. KyShanaeh is a very loving mother and a hard worker, earning a 3.6 GPA while getting a certification as a medical assistant and caring for her children. We know without a doubt that she can excel, with the right help. KyShanaeh has experienced tremendous anxiety as a result of her experiences of homelessness. Trying to figure out how to pull herself and her children out of homelessness – when she had no support system whatsoever — seemed impossible. Now that we have placed KyShanaeh in a nice apartment, UNITY and our partner organizations will help with rent and supportive services for as long as KyShanaeh and her children need that help on their way to becoming self-sufficient. With your support, we are committed to ensuring that they never become homeless again. “My life has changed so much. I am so thankful because for the first time in my life I have a real home now. I’m learning coping skills,” KyShanaeh says. Recently UNITY announced the goal of finding an apartment for every homeless family in New Orleans by Thanksgiving. With your participation, we are confident that our community can do this. After all, by providing housing and services, the coalition of organizations that UNITY leads has already reduced homelessness by 85 percent since 2007, when Hurricane Katrina’s widespread destruction of housing and family networks caused an explosion in homelessness. And we’ve already achieved the goal of making New Orleans the first city to effectively end veteran homelessness by finding apartments for every homeless veteran. We can – and must — do the same for homeless children. By joining with us to make sure that all families like KyShanaeh’s are quickly and stably re-housed, with supportive services for as long as needed, you can make New Orleans a more equitable community. Today, on GiveNOLA Day, please make a contribution to UNITY — and make New Orleans a better place for everyone to live. Choose UNITY for a donation at https://givenola.org/npo/unity-of-greater-new-orleans. We are extremely grateful for your compassion and generosity. Please click here to give to UNITY on GiveNOLA Day.